Today my friend Keenan is going to share a bit about his life in Colorado. A few years ago Keenan left a comment on a blog post of mine to let me know he’d been following along my adventures since my “Newbie in the North” days. This started an email conversation which has turned into a friendship based around blogging, setting goals and having adventures. Thanks for continuing to inspire me to set goals and make them happen. Please check out some of Keenan’s awesome adventures over at his blog “My Colorado Life”. 3 years ago I made the move to Colorado & left my NYC career. That year I set a goal to hike a different hike all 52 weeks. What an amazing year – saw so much of my newly adopted home state! In 2013, I ran a full marathon in Anchorage, Alaska. All the while I continued to follow Sarah in Pang. Northern lights, harbor icebergs, Mt Duval, SNOW, last year’s all-girl Yukon adventure, ice fishing for Arctic Char – yeah, I’m a HUGE fan of SarahontheRoad. We are now 6 months out from the inaugural Ironman Boulder! Who is getting excited? Yep, this year’s goal — complete my first Ironman. Sure I’ve never competed in a triathlon, haven’t biked since I was 9 – yet I plan to swim/bike/run 140.6 miles on August 3rd. My friend & coach, M is a swimmer. I am a dreamer. I’m a goal setter. I’m an adventurer…but I’m not a swimmer. -13 degrees F, light snow & on the road at 4:45am headed to my gym Colorado Athletic Club in Boulder – to swim. Crazy cold. Heated outdoor pool but I punk’d out this day – chose to fight the mobs & use the smaller indoor pool (only 6 lanes). Hot tubbed for 5 minutes to boost my body temp, then started today’s swim. Only 3 of us in the pool this early on such a bitter cold day. By 6:30am though, was no longer lapping up-n-back but forced to circle to permit add’l swimmers in the pool. Kinda overwhelming with so many faster swimmers. I’ve hit my Ironman distance 5 times already (90 laps up-n-back) so I know I can hang with the endurance athletes but the sprinters – no possible way. I watch them play with their watches and stare endlessly at the water. Suddenly they dart up-n-back once, sometimes 2 times & the routine starts again. Check the watch, stare at the water, scope out the pool, stare….then zing they take off. 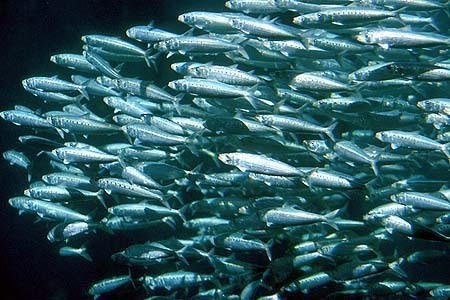 Like flashy schools of sardines. And me? Slow & steady – 2 strokes, head up, breathe to the right. Lap back — 2 strokes, head up, breathe to the left. Can’t say I love swimming but I’m efficient. Breathing technique is similar to running – slow steady deep breathing. 6 more months ‘til Ironman. Absolutely anything is possible. This entry was posted in Blogging Community on February 17, 2014 by Sarah on the Road. Good luck on that challenge, I am always inspired by those that do not let the cold weather keep them cooped up inside!